Bumper crops of tasty veg using the secrets of the professionals. Bumper crops of fresh, tasty veg. Professional quality for the home-gardener. Strong growth, pest and disease resistant, easy-to-grow. 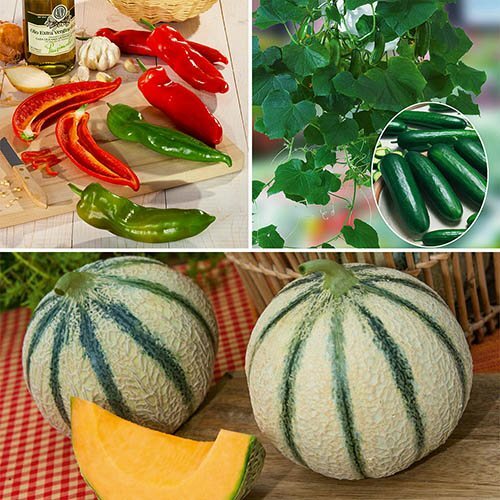 3 plants, 1 of each variety in a 9cm pot: Melon 'Perseus', Pepper 'Orias', amd Cucumber 'Mini Stars'. Grafted vegetables make it easier for you to grow crops of tasty fresh vegetables in the UK. The technique, as used by professional growers, is now available to the home-gardener and mirrors that used in fruit trees for generations - splice or graft a variety onto a strong, disease resistant rootstock, and get the best of both worlds. Skilfully grafted using the latest techniques, there are so many benefits to growing these plants and you'll notice that with much stronger growth, the crop that you'll end up with is significantly higher than that of ordinary vegetable plants. Whether grown in the greenhouse or outside, these vegetable plants just seem to keep on going and producing, and don't run out of steam like ungrafted veg. Exhibiting a better resistance to pests and disease, grafted vegetables so easy to grow - even without experience, these will thrive to produce you with an abundance of fresh, tasty crops over an extended period. A jumbo pepper with a vigorous habit, the pointed fruits are slightly contorted, initially light green, ripening to bright red and are up to 18 cm long. A medium-hot pepper with a peppery taste. At 70 cm high, you can grow the sturdy plants in a sheltered place outdoors, in a greenhouse or in pots on the patio. Harvest Aug - Oct. The snack cucumber, the tasty green fruits are produced on bushy plants. Best picked at 10cm long to provide a tasty vitamin filled snack. Harvest Jul - Oct.
A charentais-type melon with aromatic, juicy fruits. This melon can be grown in the greenhouse or in a container on the patio and will need support as it grows. Harvest Jun - Aug.